It is perfect for my small 5" kuad. I had to cut a bit the case, near the rear threaded holes, because an interferance with the FC but just because my configuration. The Swift 2 goes in most of my racing quads, it has the best low-latency of any camera! It's our hobbies industry standard for racing quads. The Eagle may have a slightly better picture, but in latency and WDR, I choo-choose the Swift 2 for mostly every race! I have several camera's, and this one this the only one which i can fly with in all circumstances. Just good out of the box. The runcam Swift 2 was a great improvement over the runcam Swift. WOW! I never imagined the shipping I got! it came in 3 days. I'll review the actual product tomorrow, I had no idea it would be here this quick. Perfect FPV camera for just about any light conditions. The Runcam Swift was a great camera and now with the Swift2 having the flight pack voltage being show on the O.S.D makes it even that much better. The Swift2 is a no brainer when it comes to choosing a FPV camera. The Swift has always been a great performing camera. Now with all the improvements you can't go wrong with this camera. The expanded voltage range, choice of lens and built in mic are my favorite upgrades. This camera is extremely crash tolerant. I can't believe some of the crashes mine has survived. All in all, a great value. It has a great image and has a built in OSD for battery voltage. 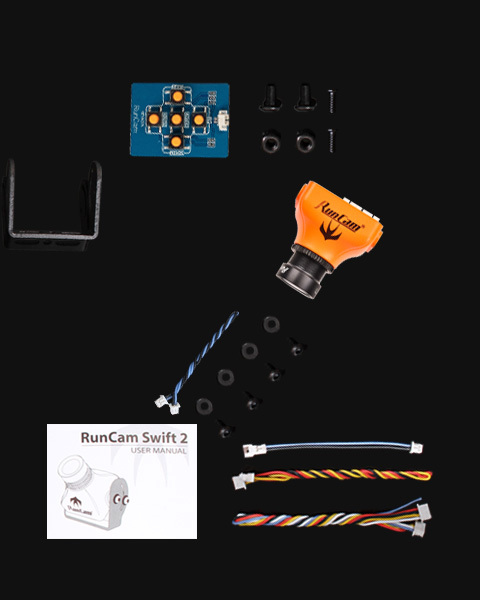 This is my second Swift 2 along with various other runcam cameras. All are still reliable so im happy. Also i like the orange. The camera meets my expectations but it lacks a bit of clarity of image, since I have other cameras more economical and they are giving me the same spectrum of images. Great runcam with buit in OSD and Mirc. Very grateful to have this run cam swift 2 built in OSD and mic . It save a lot of time and space for my quad . Thanks you runcam. And didn't realise but it also has a mic!!! This is the bedst cam to date! Im using all kindes of cams ,but this is the bedst ever i had on my drones. Going to change all my cams to runcam now!. Ony the 2.5 linse whos not the Big on. So get it on the side on you order. Great camera and fits perfectly into my FPV racing drone. Very good picture, and a lot of settings. Best cam I like. great runcam with buit in OSD and Mirc. I truly recommend this swift cam us the best for both. Best camera I have used. The osd and mic are top-notch quality. Just recently purchased two more Rancam Swift2 Cameras. No surprises here. Camera comes with the accessories you expect from runcam, nice silicone cables, I really like the extension for the menu-cable so the cam can be buried in the foam. Picture is also holding up to my expectations. I ordered the 2.3 lense and like it so far. The OSD is easy to use. I can definitely recommend this cam. puedo ver entre las sombras! El problema que tenía con mi antigua cámara era que al haber zonas de claridad y sombras, en las zonas de sombras, no se veía nada de nada, entrabas a la zombra sin saber que había. Con esta cámara se ha resuelto eso y otro problema que tenía: saber el voltaje que me quedaba. OSD directamente en tus gafas! Un precio muy ajustado para la excelente calidad de imagen y colores. Qualita eccellente la migliore al mondo secondo me ! I had the Swift 1 with RCG25 lens, and this was really the best FOV for Freestyle, but the new lens are smaller and less exposed to crash impacts. Better protected and less broken lenses. So easy to set up and works without any flaw. The mount is a huge step forward, but needs some creativity on older frames. The camera is great, MiC and OSD is a must have in our quads. Runcam has yet another great camera. I run this on my 250mm and 180mm frames. I recommend this for the drone hobbiest or racing pilot. What a product! If you don't have one yet, then you are missing out. Picture quality is very good and it handles sunlight awesomely once set right best settings I've found so far is Chad Nowaks guide followed that and am super happy. The installation was a breeze this one was fitted to my eachine wizard 3 main wires then one for audio if required and one for v batt which I soldered to an esc power line. The shipping wasn't the fastest from china but that really is the only negative thing I can say buy this cam you won't be disappointed! I have even ordered another for my next build along with the runcam 3. Thanks runcam for your great products! It has all the best features you could ask for. The next step to make it even better is have the oSD work with beta flight. Then I think you'll have a hard time to justify buying any other cam. Stunning quality with the built-in 2.3 mm lens. OSD works like a charm. If you hate installing an OSD due to all the extra wires, this is the camera you need to get. Build quality is excellent. I have one on an fpv wing and another on a 220 quad, both have survived quite a few unplanned landing without any issues. This camera seems to get far less blown out when heading towards the sun than others I have used. OSD display is the only minor complaint as the voltage displays about .2v lower than actual battery level, though with that said my lipo's probably appreciate not being drained so hard. Thanks to who ever at runcam thought put additional screws in for when one inevitably gets lost. I have really nothing to complain about. Image is super sharp and default image settings are perfect. OSD works fine. Best cam on the market right now for miniquads. The quality & clarity of the camera are excellent, the best I have used. I got the 2.3 lens & found it a little disorientating when yawing due to the wide angle curve. However, you can get used to it & it works well in some situations. Thats just my preference. The OSD was a disappointment as the voltage reading is not accurate. It shows about 0.2v lower & cannot be adjusted. 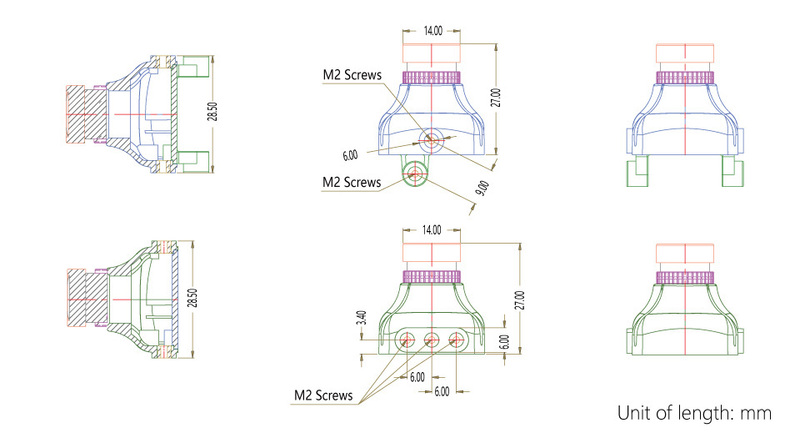 Otherwise the OSD is simple, clear & functional ~ no complaints other than the voltage issue. i didnt think it could get any better but did! I guess they listened to the customers on small improvements that made a big difference for convenient with osd pigtail and lens. On top of that the awesome customerservice they provide at runcam. Because of that, i decided to purchase more! I was using other cameras for long time, but now that i have try the swift 2 camera, i can tell it's difficult to go back. Haven't had long to test but so far so good. Image is great, I have no complaints. its great. i had swift 1 before switching to second version. the first i noticed is that every minus of old version is fixed here. quality is awesome. respect to runcam progress is very clear here. If you need an osd and keeping it right. This camera is awesome. Great camera and osd = must have. The vbat is very accurate. If the timer can be resetting or start counting when I start flying will be best of the best!! I like this camera get the widest field of view you'll love it. OSD is awesome, microphone adds the little extra I wanted. Recommend Swift 3 has horizon and level indicators. I just got mine and maddened my quad but so far it works great! The voltage sensor seems to be a bit off but other wise i would definitely recommend this camera. The setting cable is very user friendly and i like it a lot. Camera is superb product. Comes with planty mounting accessories and to bodies which is awesome. Record is briliant and vbat osd and microphone is the most amazing thing :) which I have ever seen. It is the best purchase for any fpv user.